Kafe Betawi’s concept is to maintain the native history of Indonesia and we become as part of “saving” culture of many western cultural invasion on kulinari lifestyle. Friendly and thick shades of prosperity the country, bringing you one step further in love with Jakarta. Kebaya uniform and distinctive interior design of betawi homes, more obvious with familial tradition of fellow visitors. Food process naturally and not instant, which is always fresh food, according to your taste. Just yourself or with family, enjoying a meal at Kafe Betawi is always special. Soto Betawi is as a special menu that is ready to accompany, there are other various menu such as Ketoprak Betawi, Nasi Uduk Semur, Laksa, and Lontong Cap Gomeh. Or want more options? Available delicious Oxtail Soup or a Tasty Fried Chicken served with a menu that filling. Enjoy the fresh green grass jelly ice presented with delicious coconut milk plus sugar which will eliminate the thirst for redemption. Beside Fruit Juice and Betawi Punch, for you who are missing warmer ones, you could choose Sekoteng or Wedang Jahe which ready to excite the soul accompanied by two pieces of cake creasing, various fried or grilled bananas. Thank you mas Dwiki, semoga kafe betawi makin laris manis..
@ management seminyak square : dapatkah file ini di terjemahkan pula ke dalam bahasa inggris .. ? Siap Mas Dwiki tapi sabar yaaa.. akan segera kami ganti press releasenya Kafe Betawi kedalam versi inggris. 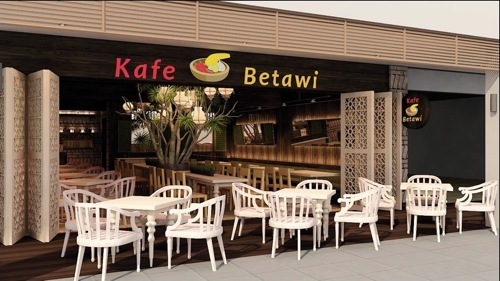 Cafe Betawi… it was bring me back, to 6 years ago, when I was lived in Jakarta… the taste, the smell and the food presentation really made me memorized about Jakarta culture and art. From Perth Australia. We loved the food and drinks at Kafe Betawi Seminyak Square, very good nasi goreng ayam, sate ayam and other dishes also great, excelent presentation and taste and very nicely priced for wonderful experience, good on you Bali! Im from singapore and we dined twice at this cafe. The food is delicious! extremely value-for-money and great friendly service. 2months from my trip and I still miss the the taste of it.. cheers! i’ve tried the one in Jakarta and it was Halal and really good!what about in bali? is it Halal?